Trident: One of the hottest trends in the market- both 2 and 3 wheelers- has been Fat Tires. And who wouldn’t want one? They are a blast to ride on rough roads, trails and sand. In all honesty though, for most of us, it’s not going to be your only ride. 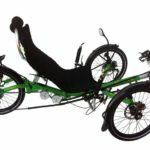 In addition, because of the nature of what you will be riding a Fat Trike on- your Fat Tire trike is likely to take more of a beating than your shiny pampered road trike. 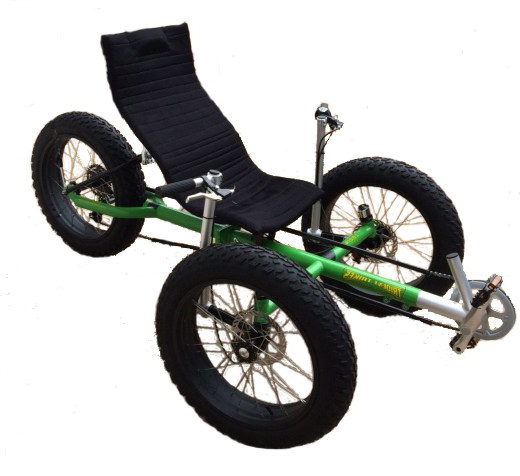 Affordable: Again- this is not likely to be your only Trike, is going to take more of a beating than your other Trike, going to ride in Mud, Snow, Sand etc- so you don’t want to invest a fortune in it. 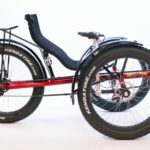 Foldable: Since our premise is that it will be sharing space in your garage with your rides, and the fact that Fat Tire Trikes are just BIG- it would be nice if it took up a little less space. 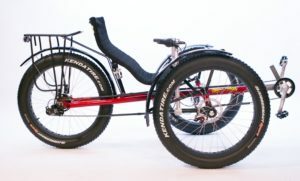 Unsuspended: There are 2 schools of thought on this obviously, and of the Fat Tire Trikes in production now, ICE & Sun, use suspension, Azub and we, do not. Here is our reasoning- First they are Fat Tires (duh)! You are running these at approximately 10PSI- this gives you all the suspension you need. Secondly, suspension- especially nice suspension- adds a lot of cost, weight, and complexity. Fun: Fat Tire Trikes are great fun to ride, but if you have ridden all the brands- you will definitely realize some steer and ride way better than others. Great handling and comfort is a must. 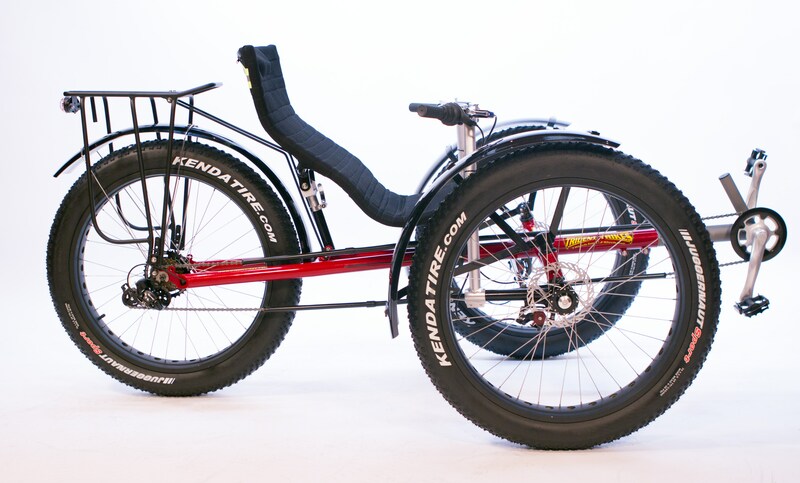 We are pleased to introduce our FOLDABLE Terrain 20 and Terrain 26 Fat Tire Trikes. The Terrain models are available with either 3 20” x 4″ Wheels or 3 26” x 4″ Wheels. Terrain Models feature a powder coated , foldable Chro- Moly frame. Terrain models will come equipped with our signature Mesh Seat with 4 adjustable angles and 3 height positions. X Seam Ranges have also been increased – the Terrain will accommodate riders with X Seams from 34 ¼” to 47 ¼” (900mm-1200mm ). We can also accommodate even larger X Seams with an XL Boom ($40 additional) . Rounding out the features are Avid BB5 Disc Brakes with locking Parking Brake Levers and a 7 Speed Shimano Drivetrain with a Twist Shifter. The Terrain 20 has a weight limit of 275 Lbs. The Terrain 26 has a weight limit of 325 Lbs. An Electric Power Assist Version of the Terrain 26 will be available in limited quantities in July 2016. 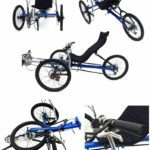 This version uses a TS Systems 350w Mid Drive Crank Motor System with 4 Power Assist Modes, a Rack Mounted 36V 13AH Lithium Battery, and Display. A 21 Speed Upgrade kit is also available. Its consists of an FSA 22/32/42 Triple Crankset, a wider Bottom Bracket, a Microsfift Front Derailleur, a Shimano 3 Speed Revoshifter, and Cabling with Cable Housing. 21 Speed Upgrade Kit gives you a Gear Inch Range of 18.5 to 85.7 on a Terrain 26, 13.8 to 58.7 on a Terrain 20. Rear Racks are also available for both Terrain 20 and 26. The first and second production runs of Terrain 20 are all Wasabi Green. Terrain 26 is available in Wasabi Green, Carolina Blue, And Wolfpack Red. *All Trident Trikes are Pick-Up only.